responsive design, rapid prototyping, user testing, and quality assurance. 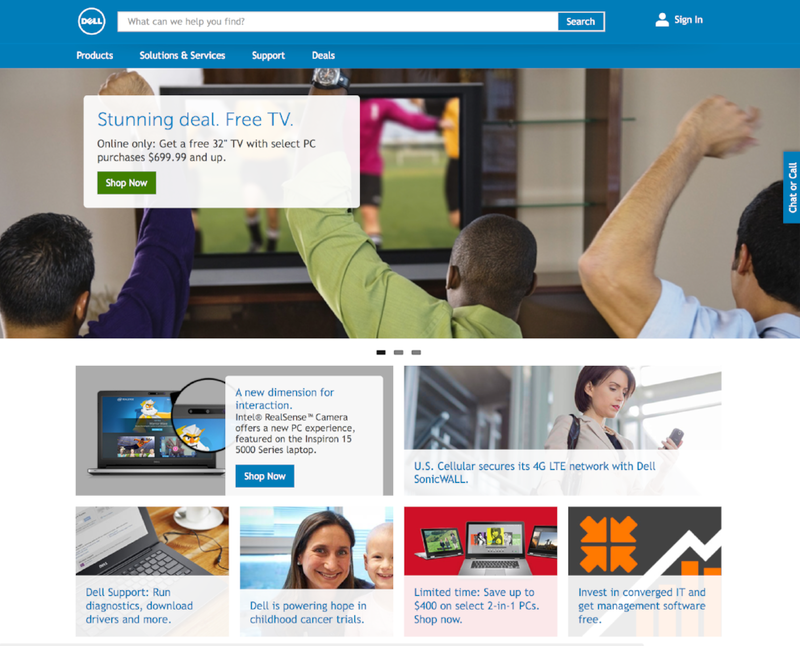 For many years, Dell.com was designed and built as a product centric e-commerce website. Dell placed all of its focus on its products and tried to sell those products to as many people as it possibly could. That doesn't sound too bad, but this created a lot of chaos and confusion with its customers. The problem was, with all of its products available on the website, the design didn't do a great job of tailoring to individual customers. They needed to place focus on the customer and understand his or her needs. When you do this, you are able to handle complaints, fix and resolve problems, and cater to every customer more efficiently. Updating the design to be more customer centric would simplify the experience and convert more visitors into leads and sales. As you can see by this design, the main navigation component at the top does not describe what the user is about to select. It gives vague wording which can be misleading and decrease site visit duration. Navigation needs to clear, short, and to-the-point. 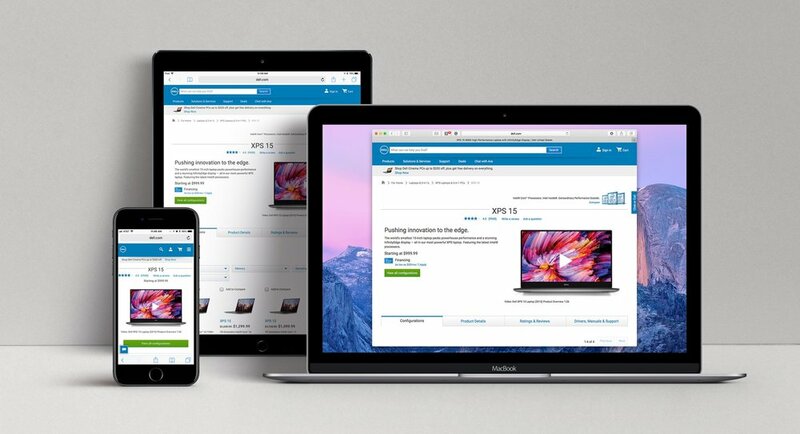 This is the start of a whole new world for Dell.com. 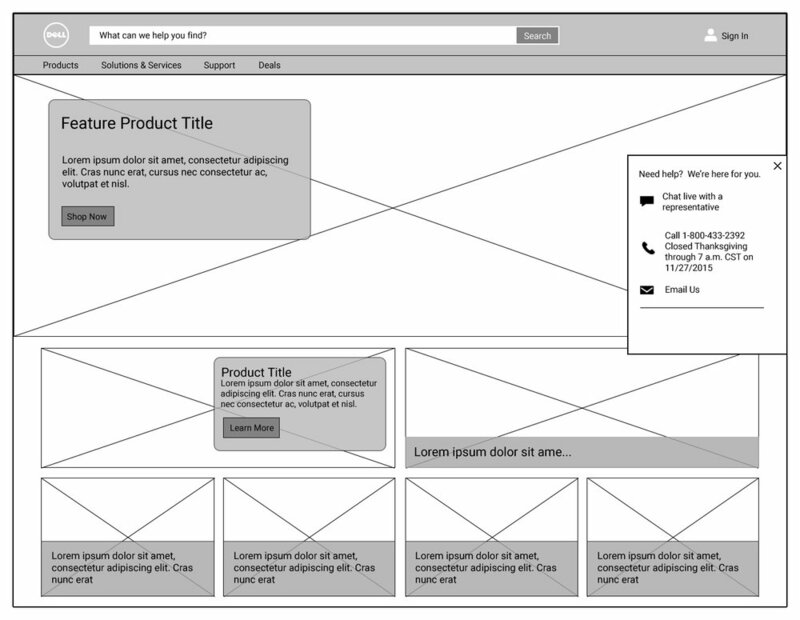 This wireframe, like many others, was presented to the business partners to convey the customer centric story and show the site components to each stakeholder. This extended dropdown component was designed to show the user a multi-tiered selection of products and increase website usability. This "Chat or Call" interaction was designed to slide out on click, as well as slide out during a certain timeframe. Its intent was to keep in view so that the user can interact with it if needed.